Y.O Ranch Steakhouse has been crowned Readers’ Choice Winner for D-FW’s favorite steakhouse. Following four rounds of voting and more than 50,000 ballots cast in the bracket, Y.O. Ranch Steakhouse has been crowned the Readers’ Choice Winner for Dallas-Fort Worth’s favorite steakhouse by the readers of the Dallas Morning News. Y.O. 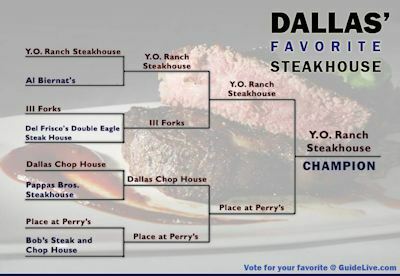 Ranch defeated Place at Perry’s in the final round, earning just over 62 percent of the vote from Morning News readers. Thirty-five steakhouses began the competition, and Y.O. Ranch defeated Al Biernat’s, and Ill Forks in the second and third rounds of voting before taking the prize over Place at Perry’s. Y.O Ranch also took the top spot in the first round with 9.27 percent of the vote out of the 35 candidates. That earned them the top seed for the next round, which saw the field shrink down to the top eight finishers of the first round of voting. Y.O. Ranch Steakhouse is one of the best Dallas steakhouses. All the décor and ambiance comes from the actual Y.O. Ranch in Texas – a nationally known ranch. They serve anything from filet mignon, prime rib, to wild game like venison and elk. But the steaks are just the beginning. Alongside their fabulous meats, they have a vast selection of world class wines, another reason why they are consistently ranked as one of the best Dallas steakhouses. For more information visit their website.